Finally, you can get the item Cristal de Busca do Caçador to help you find rares. Edit: It seems like Tesouros Saqueados and Baú do Tesouro Roubado do not drop the quest item. They still drop Cristal Apexis though. While affected by this buff Rei da Selva after I completed the quest, Rumble in the Jungle. I looted a container near the Saberstalkers Quartermaster and looted 3 Fel-Corrupted Apexis Fragments instead of the usual 1 fragment. The fastest way to get to your first (6) Fragmento Apexis Vil Corrompido is to go to the Blackfang Challenge Arena at (54,81), and kill the three champions as they are summoned one by one. On populated servers, you can just wait for others to purchase the items that summon each champion and down them, this past week you'd see someone downing all three within about 15 minutes. A huge must to have in this area regardless are Pena de Aviana and Cristal de Busca do Caçador. With the feather you can fly around up high and search out rares, if you find one, land close as you can by circling down, then activate the crystal to teleport directly to the rare, and kill it. Sometimes it teleports you to a different rare, which, if you are hunting a specific rare, that stinks, but if you are just after these crystals, no biggie, kill rare, get crystal, and then you might even be able to get to the other rare you saw before someone kills it. EDIT: HUGE help to get the last two: Once you reach revered with the Order of the Awakened, you can purchase the Cristal de Busca do Mestre Caçador. Now be warned, seems like half the time it sends you over to Varyx the Damned (requires several people to break the beams rare), but the rest of the time you can get your last two, 15 minute cooldown on the item. Here's another tip: You spend 4,250 gold to get this item, along with trading in your Cristal de Busca do Caçador. Notice though, there is a two hour window and you can sell that item back to the vendor. So use it each day to get the crystals, then sell it back. There really isn't much reason to have it other than going after rares, once you have the Espreitador da Selva and Exalted with Order of the Awakened, you aren't likely going to need the Cristal de Busca do Mestre Caçador any longer, plus you'll still have your Cristal de Busca do Caçador anyway for finding rares nearby. The Influência Invisível daily quest normally awards 1500 rep. If you have the IUPI! buff from riding the Darkmoon Carousel or using a Cartola de Negraluna during the Darkmoon Faire, you'll get 10% extra rep, or 150 more. If you have a level 3 Posto Comercial Nível 3 in your garrison, you'll get an extra 20% extra rep, or 300 more. If you're human, the Diplomacia racial ability gives another 10% rep, or 150 more. If you use all three, you can get 2100 rep from a single turn-in. (The percentage increases are added, rather than multiplied with each other). Step 3: If you did anything else in Tanaan you should be done now. If not fire up your Cristal de Busca do Mestre Caçador for a free port to the last rare you need. The three champions at Fang'rila no longer give x6 Fragmento Apexis Vil Corrompido, instead they now give x3 Fragmento Apexis Vil Corrompido in total and only the last champion drops the loot. You are unable to loot Fragmento Apexis Vil Corrompido in a raid group, neither from boxes or rares. You can purchase Cristal de Busca do Caçador once you gained Honored with Ordem dos Despertos. This is an item that teleport you to a nearby spawned rare with a 15 minute cool-down. You should complete Sururu na Selva first to grab Rei da Selva and x3 Fragmento Apexis Vil Corrompido, continue with Assault Dailies and Bonus Objectives. Use Cristal de Busca do Caçador if you struggle to find the last few Fragmento Apexis Vil Corrompido. 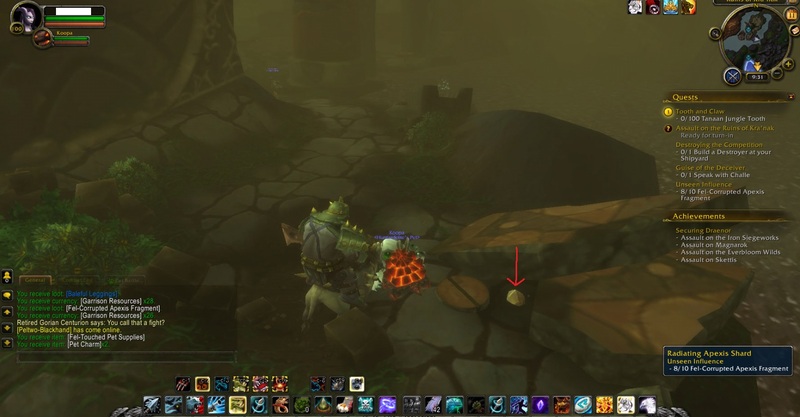 Colete 10 Fragmentos Apexis Vis Corrompidos de qualquer Tesouro ou de qualquer criatura Rara ou Elite Rara na Selva de Tanaan. A corrupção dos apexis começou a afetar muitos entre meu povo. Estamos tão habituados ao seu poder que a cada dia mais sucumbem aos seus sussurros. Você precisa trazer mais amostras para que eu possa libertar meu povo de mais uma maldição. Receio que sua ajuda não seja suficiente para impedir a ruína dos arakkoas. Vou precisar da sua ajuda até esse mundo se livrar da terrível presença que Gul'dan convocou para nos destruir.